The venerable Airfix Zero gets another outing, this time as a "Starter Set" with cement, paintbrush and four pots of acrylic paint as kit # A50085. When I first saw this I thought that perhaps, just maybe, this might be someone else's kit re-packaged or even more hopefully a re-mold. But no, it is our old friend from 1959, 50 years old! What a youngster might make of this kit as a first attempt at plastic aircraft modelling I have no idea but what a more experienced modeller can do with it was shown here. This issue repeats the markings option for the previous Special Edition 'WWII Aircraft of the Aces' for a Zero of the Tainan Ku flown by Saburo Sakai with the red bordered white tail code 'V-103'. The decals seem to be better printed and more saturated than the last issue but it remains to be seen how they behave. 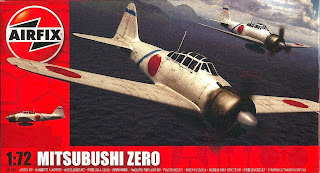 Nowhere is this information provided on the box or instructions, however, which describe it just as a Mitsubishi A6M2 Zero of the "Japanese Air Force" (sic) in 1941. Oh, dear. I'm a fan of Airfix kits and I think the Hornby takeover has given them a new lease of life and much promise, but I do wish they would pay more attention to detail and not pander to the "dumbed down" method of educating the young which seems to prevail on this blighted island (I could go on but I'll spare you that rant). The box art is new too. Sooty digital darkness showing two identical Zeros (same tail codes) scudding over the Black Sea in dramatic 3D, their dark-tinted cockpits occupied by shadowy creatures of the night. Come back Roy Cross you are sorely missed! The back of the box has an attractive colour four view painting guide with the prop shown separately which reminded me of Frog kits. On the side of the box is a sooty digital profile of the aircraft "Actual Size" (of the model) which is a nice touch. The paint call out is for Humbrol Matt 64 Light Grey for the main airframe, with Satin 85 Black for the cowling and Gloss 11 Silver for the spinner, these paints being provided in acrylic form, together with Matt 29 Dark Earth for the propeller blades. There is no interior as such but Silver is strangely recommended for the rear cockpit decking, wheel wells and undercarriage door covers. The pilot figure gets a Black helmet and boots, a Dark Earth suit and no face or hands. Humbrol Matt 64 is a slightly "warm", dove grey, which is actually not a bad match for the IJN paint colour standard J3 reported by some to be the factory paint colour for the Mitsubishi-built Zero, although the amount of green in that paint colour is disputed. It is perhaps not quite "warm" enough or green enough and a little too dark for "scale colour" (if you believe in that) but is actually nothing like the pale, creamy colour shown on the box art. The painting guide on the back of the box is better but conveys the impression of a paler silver grey. We'll have a look at J3 in more detail in the next episode of 'Painting Into A Corner' so this "new" Airfix Zero is a timely introduction to that. Whilst Matt 64 lacks the amber caste recorded on Zero relics and even sufficient warm caste for J3, it is actually not a bad choice by Airfix, certainly a step forward from the very pale, almost off-white of the traditional early Zero and probably the closest Humbrol out of the tin to a colour representing a Zero "average" taking into account all recent revelations and assertions. The main problem is the dead matt finish which is not representative, although in some quarters both the colour and the finish may be seen as depicting the chalked and oxidised "olive grey" quite well. 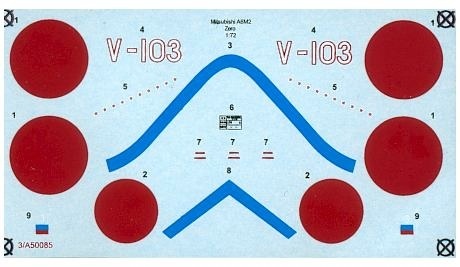 Image credit: Box art ©2009 Hornby Hobbies Ltd; Decal sheet ©2009 Hornby Hobbies Ltd.